He hath showed strength with his arm : he hath scattered the proud in the imagination of their hearts. He remembering his mercy hath holpen his servant Israel : as he promised to our forefathers, Abraham and his seed, for ever. 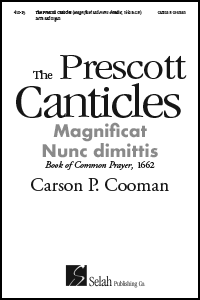 Glory be to the Father, &c.
As it was in the beginning, &c.
Carson Cooman has written a moderately easy setting of the traditional Evensong canticles, designed to be effective even with a small choir. In the “Magnificat,” the melody soars over a rising ostinato figure. The “Nunc dimittis” (with a gently bouncing accompaniment) finds a sense of quiet, child-like joy in the vision of the aged Simeon seeing the infant Jesus.